Construction is in full swing on Wyandotte Street West in the University of Windsor area. 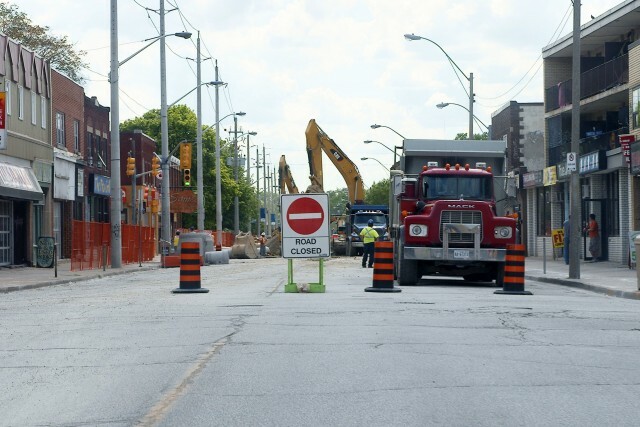 The busy stretch of Wyandotte is now closed to traffic between Sunset and Rankin Avenue — the street had been closed up to Randolph for the past few weeks. Construction is all part of a large-scale streetscaping project. Workers will replace watermains and sewers, reconstruct curbs and sidewalks, install benches and new signage, bury utility wires and repave the roadway. The street will be designed for “shared” vehicle/bicycle traffic due to the narrow roadway. The City of Windsor’s landscape architect team explained the rationale for the lack of dedicated bike lanes as a plan to accommodate heavy UWindsor pedestrian traffic in the area with a shorter path from one side of the road to the other. Wyandotte West will reopen on or before September 28th.